The York Region Branch of the OGS is proud to present an evening with Mark Olsen. Mark is the Family Tree Maker Ambassador to historical and genealogical societies around the world working to support their members as they use Family Tree Maker. Mark is a graduate of Brigham Young University and holds a bachelor’s degree in Family History with a Spanish records emphasis. He has been working in the genealogy industry since 2007. Learn about Family Tree Maker, have your questions answered, and purchase the latest version of the FTM software. This event is open to everyone. Membership with OGS is not required. Please follow this link to register for the event. Seating is limited. Our first Branch meeting is on Wed. April 11 from 7:15 to 9:00 pm at the Richmond Hill Library. Yonge St and Major MacKenzie. The first series of programs that have been organized for January to April is an introductory series on genealogy. They will feature 2 programs by Ruth, one with Linda Reid and one with Marian Press. I am very excited to have been able to get such a great group of speakers for this first series. Please find attached a poster. Feel free to share it with others who might be interested. Any additional promotion of this is greatly appreciated. For those who may have missed Linda Reid’s presentation on DNA at your September meeting, here is a second chance. Registration is now open. You can find them through our programs page on the RHPL website or by searching for Genealogy near Richmond Hill on Eventbrite (https://www.eventbrite.ca/). We charge a small registration fee of $6.00 plus HST to help defray our costs. The meeting will be held at Richmond Hill Public Libary. Renovations to the Local History Room at the Central Branch of the Richmond Hill Public Library are complete. The genealogy library is now available for use. 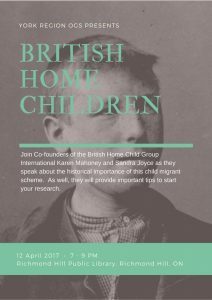 Join Co-founders of the British Home Child Group International Karen Mahoney and Sandra Joyce as they speak about the historical importance of this child migrant scheme. As well, they will provide important tips to start your research. Due to some renovations, the 4th floor of the Library where our books are stored is closed. Renovations are expected to last for 4 to 6 weeks.